The seizure comes days after 300kg of elephant ivory was also impounded in the country. 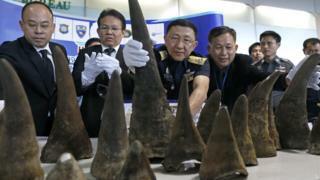 Thailand is seen as a transit point for the illegal trafficking of wildlife. Several species of rhino are at critical risk of extinction, conservationists say. The horns arrived at Bangkok's international airport where two Thai women who had travelled from Vietnam and Cambodia came to collect them. According to Thai police, they ran off when the luggage was subjected to a random check. Officials describe the incident as an elaborate smuggling effort which involved several other people inside Thailand and abroad. Wildlife campaigners believe the rhinos were probably killed to order in southern Africa, a BBC correspondent in Bangkok says. Activists say that despite improvements in Thailand's anti-smuggling efforts, its main airport remains a popular hub for wildlife smuggling in Asia. Some 29,000 rhinos are left in the wild today compared to 500,000 at the beginning of the 20th Century, according to the International Rhino Foundation. Earlier this month, poachers shot a rhino dead and hacked off its horn at a zoo in France in what is believed to be the first such incident in Europe. Last month poachers stormed an animal orphanage in South Africa and killed two rhinos for their horns after taking staff hostage. Rhino horns are prized in some Asian cultures as an ingredient for traditional medicines believed to be effective in treating ailments ranging from fever to cancer.